When purchasing a home for investment with the intent to Flip or Hold you need to consider the Value Analysis of the property. In Real Estate Investment you make your profit when you purchase. We are going to look at the Hold Analysis. Yep, Rent property for passive income which I believe is great for long term investment. We are going to look at Hold Analysis for Monthly Cashflow, 1 Year, 3 Years, 5 Years, 15 Years and 30 Years. Gross Rent – This is your monthly rent that the tenant will pay. A good estimate in most cases is 1% of the property value. In our case its $1,300 monthly. 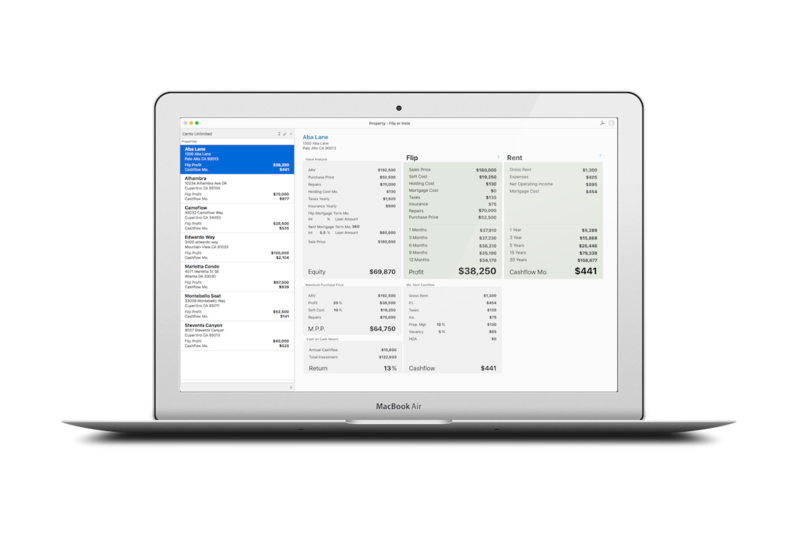 Expenses – This is the sum of the Taxes, Insurance, Property Management, Vacancy Factor, HOA (Home Owner’s Association) and any Other Expenses. These expenses do not include any Mortgages. It will total to $405 monthly. Net Operating Income – We take the Gross Rent – Expenses. $1,300 – $405 = $895 monthly. Cashflow Mo. 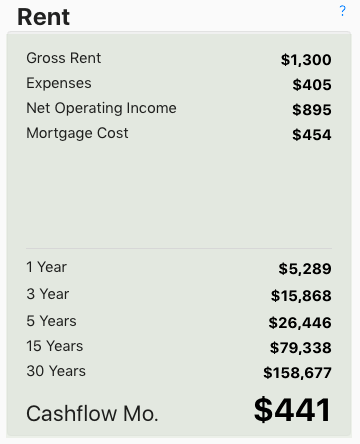 – We take the Gross Rent – Expenses (Same as Net Operating Income) – Mortgage Cost = Cashflow Mo. (our monthly profit) of $441. Let’s take a look at the next 30 Years to see what our Cashflow might look like. Please remember that at this point we are not taking into consideration any possible Rent Increases. We are assuming the numbers stay the same. Throughout these Property Flip or Hold posts we are trying to quickly take a look if it’s more profitable to Flip or Hold the Property. 1 Year – If we keep our property for 1 Year our Cashflow will be $5,289. 3 Year – If we keep our property for 3 Years our Cashflow will be $15,868. 5 Year – If we keep our property for 5 Years our Cashflow will be $26,446. 15 Year – If we keep our property for 15 Years our Cashflow will be $79,338. 30 Year – If we keep our property for 30 Years our Cashflow will be $158,677. It’s time to put it all together and see what our Cashflow can be.